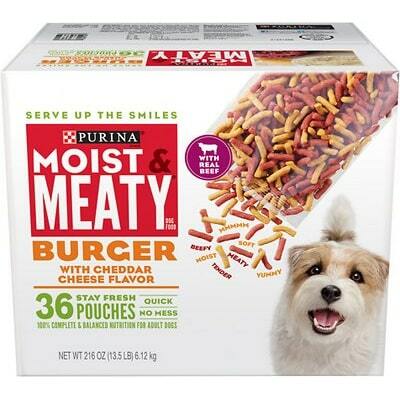 Moist & Meaty Burger with Cheddar Cheese Flavor is a low-priced dog food that is overall a lower quality. This product has 12 controversial ingredients, which include artificial preservatives, colors and even flavors. The food has a high amount of carbs, compared to its protein and fat, with varied qualities of meat and fat. 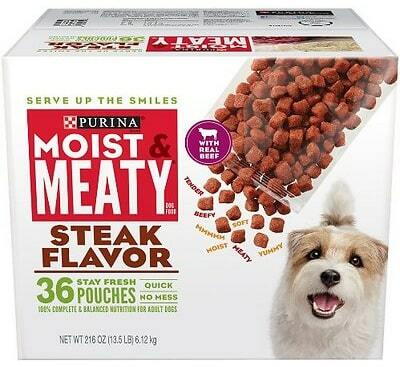 Nestlé Purina, which owns the Dog Chow brand, has more than the average number of recalls. But on a good note, they were overall pretty transparent when answering our questions. Beef By-Product, Soy Flour, Soy Grits, High Fructose Corn Syrup, Water, Wheat Flour, Corn Syrup, Beef, Phosphoric Acid, Calcium Carbonate, Animal Fat Preserved with Mixed-Tocopherols, Salt, Sorbic Acid (a Preservative), Cheese Powder (Source of Cheddar Cheese Flavor), Calcium Propionate (a Preservative), Soybean Oil, Added Color, Dl-Methionine, Zinc Sulfate, Ferrous Sulfate, Ethoxyquin (a Preservative), Vitamin E Supplement, Manganese Sulfate, Niacin, Yellow 6, Red 40, Yellow 5, Vitamin A Supplement, Calcium Pantothenate, Thiamine Mononitrate, Copper sulfate, Riboflavin Supplement, Vitamin B-12 Supplement, Pyridoxine Hydrochloride, Folic Acid, Vitamin D-3 Supplement, Calcium Iodate, Biotin, Menadione Sodium Bisulfite Complex (Source of Vitamin K Activity), Sodium Selenite. The average dog food we reviewed has 39 total ingredients, with 1 controversial ingredient. This product has a staggering 12 total controversial ingredients. Of those, 3 can be found in the first five ingredients. This is concerning because the first 5 ingredients make up most of the product. Also called EMQ, it is used as a preservative to prevent the destruction of some vitamins as well as slowing fat from becoming rancid. Commonly used as a pesticide, it is banned as a food additive in the EU and Australia. The metabolites formed when this ingredient is being digested by humans and animals could potentially damage DNA, as well as cause mutations in the genetic material. Moist & Meaty Burger with Cheddar Cheese Flavor is made in the USA. The meat and fat quality of this food varies. The meats are clearly described as Beef By-Product and Beef. However, Animal Fat is listed as an ingredient. This doesn’t show you which animal or animals this fat comes from, making it a potentially lower quality ingredient. This product contains 2 controversial preservatives called Ethoxyquin and Calcium Propionate. We described them in detail above, but please note: It’s good to know that ‍not all artificial preservatives are bad. That’s because they serve an important purpose, which is to prevent food from spoiling. However, we consider 11 artificial preservatives controversial because of their potential link to cancer and other serious health conditions. Besides controversial preservatives, Moist and Meaty also packs a total of four artificial colors: Added Color, Red 40, Yellow 5 and Yellow 6. That’s totally unnecessary and a potential health concern to dogs. While it scores low for preservatives and colors, Moist & Meaty Burger with Cheddar Cheese Flavor shines for not having any artificial flavors. It’s cheesy flavor comes from cheese powder.